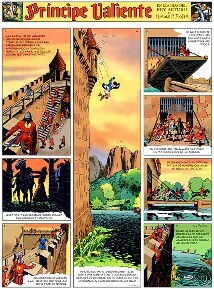 Planeta de Agostini is an old publisher and started to reprint the Valiente serie. The first 3 books are re-coloured on the computer. See the color example below. With the first few books comes a present: the Spanish translated version of "Prince of Illustrators" (see reseource books chapter). There are now many books printed. Click here to go to the website of Planeta. You can't buy the books there as a foreigner, so you have to contact a comic shop in Spain. If you like to compare the new colors with other book publishers, click this link . Value is around 3 Euro for the first 3 books, and 8.95 Euro for later (future) issues.